Smoking has obviously and significantly impacted human mortality. And while the death toll from smoking may be its most striking legacy, the study of smoking also reveals aspects of social, cultural, economic and political history, all areas that I explore in my monograph on the history of smoking in Italy in the nineteenth and twentieth centuries. [i] In what follows I present some of the available smoking statistics in post-World War II Italy and close with an observation on mortality. Figure 1 describes legal sales in Italy from 1950 to 2005 as recorded by ISTAT, the Italian National Statistics Institute. It shows steady increase from 1950 to the mid-1980s followed by a curious dip. Both sections of the graph merit scrutiny. Following the disaster of World War II (and tobacco rationing), Italian tobacco consumption certainly increased. 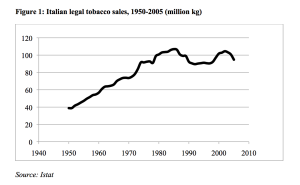 Studies of per capita consumption (for Italians 15 and over) of legally–sold tobacco suggest that it increased from about 1 kg per person per year (1000 cigarettes) in 1950 to about 2.3 kg in the mid-1980s and then declined. What the ISTAT figures leave out of course is contraband, notoriously widespread in Italy until recently. Estimating the level of contraband is tricky. One method might be to compare smoking prevalence and individual levels of smoking to get a different consumption figure. The Italian division of the Gallup polling organization (DOXA) started surveying smokers in 1949 (see Figure 2). In addition to estimating the prevalence levels shown in the figure, participants were also asked about the average number of cigarettes smoked per day. If the combination of prevalence and cigarettes per day figures are to be believed, then Italian consumption in 1949 was about double the reported legal sales for that year. [ii] One possible explanation is over-reporting: there were still many Italians in 1949 who could not afford to smoke all the cigarettes they would have liked. Perhaps they reported themselves as regular smokers when they were instead only aspirant or occasional smokers. The other explanation is, again, contraband. These figures then might suggest that smuggling accounted for as much as 50% of consumption at the time. Subsequently the excess consumption suggested by the survey figures would decline. I’ll come back to this below. As figure 3 shows, Vanoni was prescient. 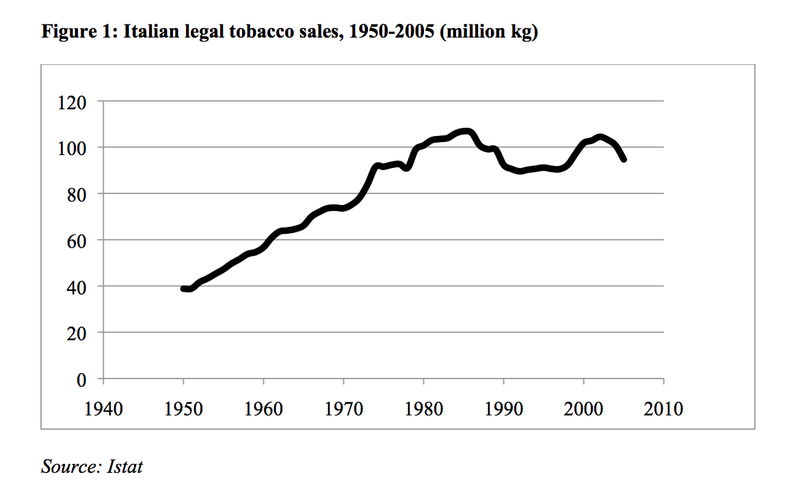 Tobacco consumption (legal sales) tracked per capita income perfectly between 1953 and the mid-1980s. 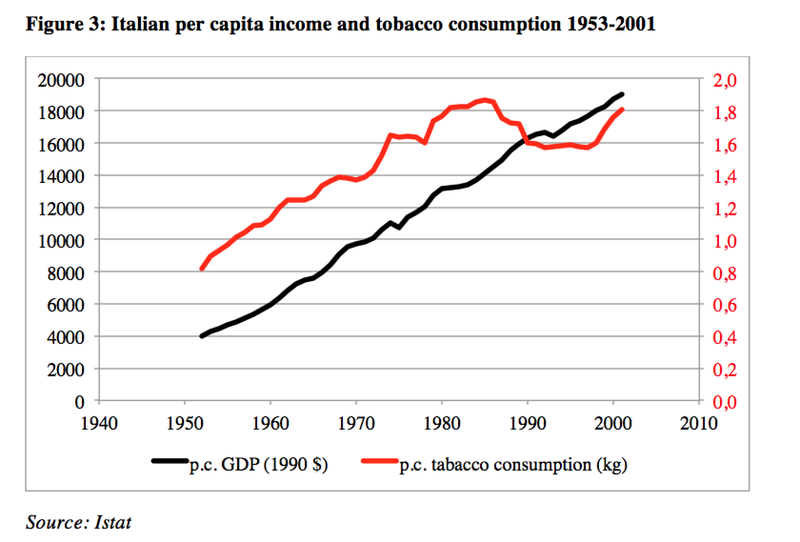 By the latter date, Italians could pretty much smoke as much as they pleased (as had not been the case c. 1950). Some were even beginning to think that maybe they might smoke less. According to a retrospective study, upwards of 50% of men aged 20-50 smoked in the 1930s and 40s. Female smoking was instead rare in that period. 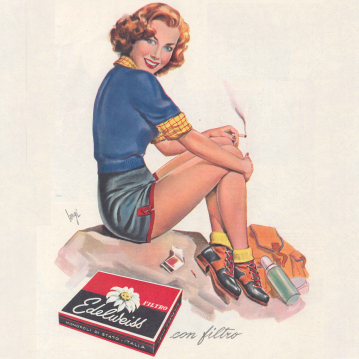 Cohorts of women in this same age range in the 1930s and 40s reported smoking rates of mostly about 2 or 3%. [iv] Returning to Figure 2, we can see that self-reported smoking for men was very high in 1949, over 70% as compared to the retrospective figure referred to above of about 50% ten years earlier. By 1950 smoking was indeed a mass behavior among Italian males. Subsequently, reported male smoking prevalence declined steadily to a level below 30% by 2005. Also interesting to note is that the possible over-reporting that characterized the first DOXA reports gradually declined and after 1970 was replaced by apparent under-reporting, i.e. reported behavior adds up to a level of consumption below that reflected in legal sales. Social attitudes regarding smoking of course changed over these decades so we can imagine that by 1980 smokers were inclined to minimize rather than maximize their reported consumption. Figure 2 suggests that smoking prevalence among adult women increased from under 10% in 1960 to nearly 30% by the mid-1980s. 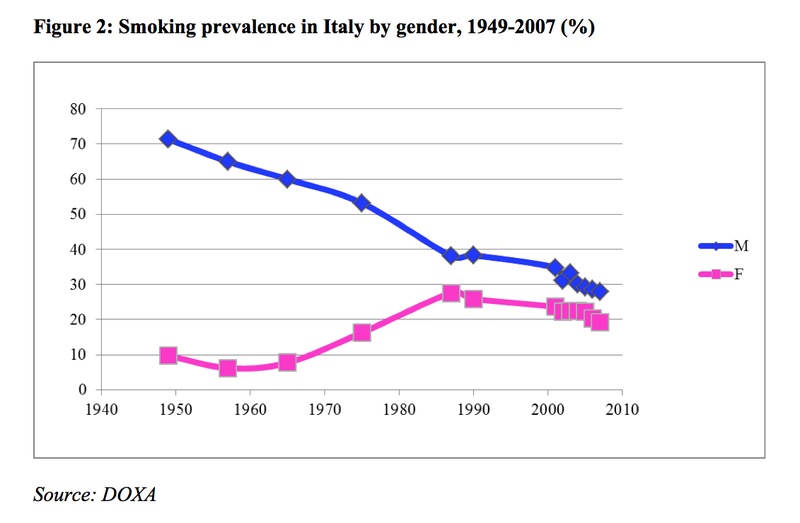 For all the imperfections of the data, there is every reason to believe that Italian female smoking did increase in those decades. In 1968 Noi Donne, Italy’s leading feminist periodical, ran a cover story on the dangers of smoking. The article notes that while female smokers were still a minority in Italy– 3m as compared to 13m male smokers – attitudes had changed. Smoking for women had previously been considered sinful behavior but: “when the taboo fell, many women saw smoking as a symbol of liberation, an affirmation of equality regarding a right that, at least in Italy, had till then been reserved for men.” The magazine ran a similar piece three years later, by a different journalist, that made similar points: “While until a few years ago women who smoked constituted a minority, today, alas, liberation has brought women equality also in this unfortunate activity; especially among younger women there are few who do not carry in their purses a pack of their preferred brand.”[v] Women had started smoking in large numbers much earlier in Britain and the US, but in Italy smoking was, alas, the collateral damage of second-wave feminism. According to some sources, tobacco smuggling in Italy may have been very high in 1950, as high as 50% of legal sales, and then declined over the next couple of decades to 10-20 per cent of sales. [vi] One source claims that by 1985 contraband accounted for a mere 1 per cent of sales. [vii] That figure seems very low, but if we take the extremes and imagine that smuggling declined from 50% of the market in 1949 to 1% in 1985, then contraband would raise the consumption curve suggested in figure 1 and make for a flat (and much higher) level of consumption over the years 1950-85. 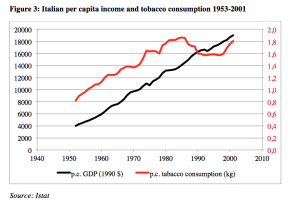 Italian incomes increased dramatically over that period, and there is good reason to believe that both over-all and per smoker consumption increased in those decades, though perhaps not as steeply as suggested in figure 1 (and so also 3). Subsequently, smuggling increased once again, reportedly reaching 17m kg by 1998, or about 18% of legal sales. After that, smuggling declined, probably to less than 5% of sales in 2005. [viii] Incorporating these contraband figures smooths out the 1990s dip in legal sales shown in Figure 1, and it is reasonable to conclude that Italian consumption was fairly steady, at about 2kg per person per annum, throughout the 1980s and 1990s and only really started to decline after about 2000. Another way to measure smoking prevalence is via mortality figures as lung cancer rates tend to run about parallel to smoking ones with a lag of 20 years or so. As one would expect, the lung cancer rate for Italian men increased rapidly from 1960 to 1980 and then leveled off and started to decline after about 2000. The lung cancer mortality rate for women instead started to increase notably in 1980 and continued steadily upward after that. Although always well below the male rate, it may not yet have begun its decline. Awareness in Italy about the dangers of smoking has evolved significantly since the end of World War II when smoking seemed to pervade all Italian spaces, or perhaps since 1962 when Vittorio Gassman in the delightful Il sorpasso (The Easy Life) warned the till then sheltered Jean-Louis Tritignant that NOT smoking was bad for his health. By contrast, 2005 saw near universal observation of the Sirchia Law banning smoking in all closed public places and so the embracing of a non-smoking culture, to the surprise of many observers. [i] C. Ipsen (2016) Fumo: Italy’s Love Affair With the Cigarette. Stanford, Stanford University Press. [ii] C. La Vecchia (1986) “Smoking in Italy, 1949-1983”, Preventive Medicine, 15: 274-81. [iii] E. Vanoni (1951) L’Osservatore dei Monopoli, VII, 5-6 (v-June). 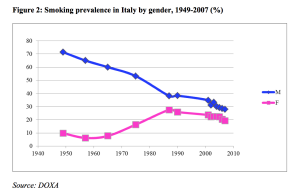 [iv] C. La Vecchia, A. Decarli, R. Pagano (1986) “Prevalence of cigarette smoking among subsequent cohorts of males and females in Italy”, Preventive Medicine, 15: 606-13. [v] M.Aloisio(1968) “I pericoli del fumo” Noi Donne, 23 (24 February): 32-5; S. Argentieri (1971) “La salute va in fumo”, Noi Donne, 26 (13 February): 10-13. [vi] C. La Vecchia, V. Scarpino (1993) “Smoking in Italy, 1987-90”, Tobacco Control, Autumn, 2(3): 231-235; C. La Vecchia, R. Pagano, A. Decarli, M. Ferraroni (1994) “Smoking in Italy, 1990-1991”, Tumori, 80(3): 175-80. [vii] L. Joossens, M. Raw (2008) “Progress in combating cigarette smuggling: controlling the supply chain”, Tobacco Control, 17: 399–404. [viii] S. Gallus, I. Tramacere, P. Zuccaro, P. Colombo, C. La Vecchia (2009) “Cigarette smuggling in Italy, 2005-8”, Tobacco Control, April, 18(2): 159-160.